“For a week in March, Houston was the site of a world assembly of oil producers engaged in an OPEC-Russia dialogue with American shale or light tight oil producers on supply and — indirectly — price. OPEC and Saudi Arabia pitched a market information offensive. Put simply, American oil producers should cut-back or stabilize output in a “family” arrangement to avoid an expansion of supply that threatens the price of world oil. But there is no U.S. Oil Company (government owned) in America, unlike all members plus Russia which are state companies. Russia is a mix. OPEC members are a price-setting cartel. So, a restaurant in Houston was selected as the site for an elite dinner of OPEC and American shale oil operators. Platitudes and generalizations dominated the American-initiated conversation, because anything more would be in violation of U.S. anti-trust laws. Saudi Arabia, consistent with its effort to sell shares in itself in an Initial Public Offering (forthcoming), emphasized there was enough future world demand to satisfy the Americans as well as OPEC. Does the future demand short term or long term offer support for an unspeakable and unenforceable supply agreement that involves enough for all? Will American shale producers in the Permian exclude themselves from capturing any growth of demand? Devon, no longer in the San Juan Basin, but dominant in Oklahoma, is going for double-digit production increases yearly and is increasing its dividend to shareholders who might otherwise be attracted to the idea of drilling and completing less to prop up the price per barrel. The Houston dinner failed, as a half a dozen companies did not show up in compliance with legal restrictions. It failed to persuade the America shale industry to act with OPEC’s oil supply and price management as a “family” and not as a law-breaking cartel. Less than a week later, Iran signaled that it would not renew the production cut that has removed 1.8 million OPEC barrels of oil from the world and increased prices. Saudi Arabia was projecting a forecast that a tight market for oil is ahead this year or next as oil projects will not replace wells while demand is strong. Few were sold on this forecast since shale oil well completions are effectively responsive to price signals with well completions compared to conventional replacement-based on prior oil field investment. Oil traders are largely unconvinced or agnostic listening in to the Houston contradictions. Most will watch Iran in late May as a sell signal in the making of algorithms. The Trump Administration on steel tariffs takes the Obama Administration’s failure to do so as a starting point. It was Secretary of the Treasury Lew under Obama who made the case for tariffs during his many visits to Beijing. 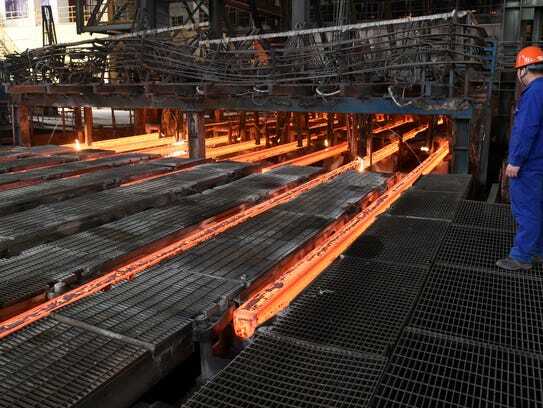 He would accuse China of promoting an overcapacity of steel production for export and consequent flooding of the American market and the United States with cheap steel. The Chinese no doubt listened politely to the words but did not anticipate action. They followed a strategy of export price advantage for driving American-owned and operated steel out of business. Action was taken last month by President Donald Trump. And yet nothing in the customary reaction against Trump recalled that President George W. Bush declared sanctions against Chinese Steel export dumping over 10 years ago, which lasted 18 months, and is credited for an American steel innovation-led comeback. National security requires American made high-quality steel not only for defense and defense-industrial capability, but also for the complex steel in San Juan and Permian natural gas and steel pipelines. What is needed is metallurgy for manufacturing and equipment for continuous casting, cooling, rolling and welding. There is only one plant left in the United States that has some capacity for high strength pipeline steel (API X70 and X80). The oil and gas industry in the San Juan Basin should not depend on imports from a non-continental foreign source as a matter of national security. China already dominates the American market (oil and gas) for steel valves. There is vulnerability if China follows its rare earth history. First, it lowered prices via exports. Second, with this weapon, American rare earth domestic production failed and China bought the technology and transferred it to China. Third, China raises prices for American users of rare earths. The North American Trade Agreement (NAFTA) negotiations continue with more confidence that fuels (natural gas) will be exempt from negative outcomes. The exemption for Canada and Mexico from steel and aluminum tariffs based on a no-threat-to-national-security finding and continental sources, suggests understanding that trade in fuels will not be restricted. Daniel Fine is the associate director of New Mexico Tech’s Center for Energy Policy and the State of New Mexico Natural Gas Export Coordinator. The opinions expressed are his own. For a week in March, Houston was the site of a world assembly of oil producers engaged in an OPEC-Russia dialogue with American shale or light tight oil producers on supply and — indirectly — price. “The price of oil in 2018 will be volatile with commodity market traders selling on signals of OPEC-Russia “cheating” or members producing more oil than the extended Algiers Agreement output quotas. This should be expected as U.S. shale producers push past 10 million barrels per day and exceed 1970 as the all-time high for the United States. At 10.4 million bpd (barrels per day), American oil production will surpass Saudi Arabia and Russia. Herein lies the price range: 2015 all over again. Real OPEC and Russian output will break Algiers (1.8 million barrels off the world market until September). Price range to $62.50 WTI high in the first half of the year and $38.65 at end of the second half or one year from today; 2019 would resemble most of 2015. There is a second threat to price and production in the Southwest and Dakota. Hedge funds invested in public or listed companies want share buy-backs or dividends. In short, they want to make money now as opposed to operators sinking more cashflow into new production projects. The conflict inside Hess is the first example. Traditional oil operators are 5-year business planners for returns on investment while the new private equity owners or investors are quarterly or payback pressure points for higher stock market share prices and distribution. OPEC/Russia is the external market threat leading to the lower price range alongside an internal investor/owner threat of less cash flow plow back for future production projects and more for short-term return on investment.